Ok, maybe a short story based on the whole sugar high/crash idea. I remember when my brother, sister and I were kids. Every year we would get our mother a large heart shaped box of Fanny May candy for Valentines day. We used her money to buy it of course and I am fairly sure that any change went for things like Lemonheads and ice cream. Well, each and every year, mom would put the opened box into the fridge. She wasn’t a huge sweets eater (obviously I get my love of them from my sweets binging diabetic father hehe) so would put it there with, I’m sure, the idea that when she wanted a piece (ONE piece) she could get one (again… ONE piece. Who does that!?). Well, every.single.year. mom would invariably come to us with a heart shaped box asking what had happened. Why? Because what she held was a practically empty box bearing only one or two pieces of candy that had a bite out of the side, those pieces being the ones none of us kids liked. Mom always said she hoped I had kids just like me. I did. I now have a “stash” of candy and junk food in my closet that the kids are supposed to stay out of. HA! yeah, right. The ones living at home go in it all the time and the ones who come and visit head straight to the stash, coming out bearing junk food galore and innocent expressions. On a side note, taking a drink of Pepsi Throwback after eating a huge serving of flan isn’t advisable. It has absolutely no flavor according to my “sweeted out” taste buds plus I think my pancreas just cried a little, then died. This is one yummy flan btw. Sweet (oh my, is it sweet), quite coconutty, with that mouth feel texture that everyone loves (man, that sounds vaguely obscene. but then I’m tired and everything is making me titter). The caramel sauce on the top is the perfect topping. I used to make flan just for the topping. I swear I did. I’m weird. This is intensely coconutty so if you’re so so about coconut flavor this may be one you need to pass by. Pour your sugar into a small saucepot. Heat it over medium high heat until it is melted and a nice golden brown color. Don’t walk away once it starts melting. It doesn’t take long to go from melting to scorched and wasted. Pour the sugar onto the bottom of 8 one cup ramekins, swirling to coat the bottom of the ramekins with the melted sugar. Whisk the eggs and egg yolks in a large bowl until foamy. Add in the condensed milk, cream of coconut, cream, vanilla extract and vodka. Whisk until well combined. Strain through a fine mesh strainer into another bowl (preferably one with a pour spout) or large measuring cup. Pour the flan mixture evenly into the prepared ramekins. Set the ramekins into two deep baking dishes. Set into the oven then carefully add hot water to each pan to go about halfway up the sides of the ramekins. be careful not to slosh any INTO them though. Bake at 325 degrees until the center is almost set, about 30 to 40 minutes. Carefully remove from the pan (I used tongs) and set on a wire rack for about an hour, then transfer to the fridge to chill for at least an hour. Carefully slide a butter knife all around the edges of each flan and invert onto a plate. If it doesn’t come out, place the ramekin into hot water for a minute or so to loosen it up, then try again. Garnish with the toasted coconut if using. 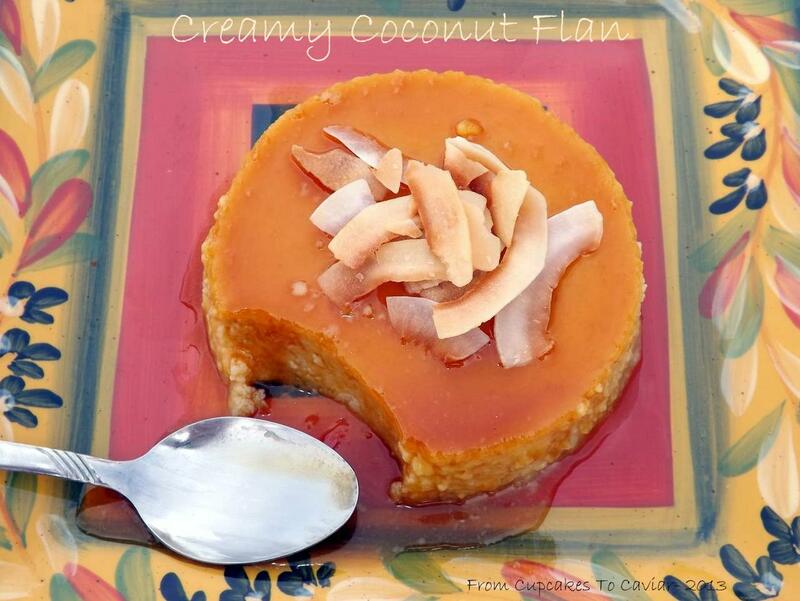 This entry was posted in coconut, Desserts, Easy, Pudding and tagged coconut, dessert, easy, Flan by Janet. Bookmark the permalink. I love reading your stories, Janet. I know that we are from different planets, but your stories bring me back to my own childhood. Change the word father to mother in the “sweets binging” sentence. Also change the word I to she in the “have a stash” sentence and that would make this my story. Yummy coconut flan. It could have been Asian save for the vodka. That is so Janet. If you make it Maureen, try to let it stay chilled for a day before having it. the first day I found that the texture was grainier than the typical flan I’m guessing because of the texture of the cream of coconut. but the next day it was smooth and velvety. How cool, I love the idea of coconut flan! I’ve never made or tasted flan! I will have to add this to the “must try” list! Love coconut and flan, but never thought of putting the two together. Only problem is, I live in Japan right now and no coconut vodka. Can you suggest a substitute?? Lisa, you could probably use any liquor that appeals to you that would meld well with the coconut flavor or even just sub extra cream instead of alcohol. But if you do want to use the alcohol, maybe rum? Wow does this flan look luscious! What a wonderful, wonderful recipe!